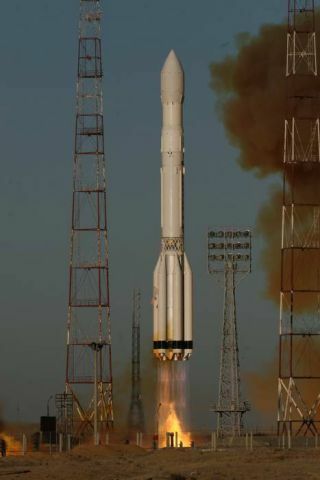 PARIS ?Russia's Proton rocket will return to service at the end of December tolauncha large commercial telecommunications satellite following a governmentinquirythat found the vehicle's Dec.5 failure was caused by overfueling ofits upper stage, Russian and International Launch Services (ILS)officials saidDec. 10. The statecommission investigating the failure, in which three Russian Glonasstiming andnavigationsatellites were destroyed, has cleared Proton's three lowerstages from anyinvolvement in the malfunction. Commercial Proton rockets marketed byReston,Va.-based ILS use the same lower three stages but a different upperstage,called Breeze M. The Glonass launch used a new version of the RussianBlock DMupper stage. The Russianspace agency, Roskosmos, on Dec. 10 confirmed the commission'spreliminaryfinding that the three Protonstages need not be grounded. A final report is due as soon asthe week ofDec. 13. James M.Bonner, chief technical officer for ILS, said the new version of theBlock DMstage ? which is built by RSC Energia of Korolev, Russia ? featureslargerpropellant tanks. In whatappears to have been a remarkable oversight, the personnel fueling theBlock DMstage for the Glonass launch did not account for the larger tanks. Thatled toloading between 1,000 and 2,000 kilograms more propellant on the BlockDM stagethan what had been planned for the Glonass mission. Like the U.S. GPSnavigation satellites, the Glonasssystem operates in medium Earth orbit. As a resultof the excess propellant, the Proton's third stage, suffering from theadditional weight it was carrying, underperformed, placing the Block DMstageand the stack of Glonass satellites into a lower-than-planned,suborbitaldrop-off point. ILS is ownedby Khrunichev State Research and Production Space Center of Moscow,which isprime contractor for Proton's three lower stages as well as for theBreeze Mupper stage. In aninterview, Bonner said ILS will spend the week of Dec. 13 in Moscowreviewingthe state commission's findings. After consulting with insuranceunderwritersand with Paris-based Eutelsat, whose Ka-Sat satellite is ILS's nextProtonpassenger, Ka-Sat's launch will be moved from Dec. 20 to a yetundetermined datein late December, he said. "Wewill be there to do our due diligence and to review the statecommission'sfindings," Bonner said. "Our assumption now is that this will cause adelay of seven or eight, or up to 10 days." Russianholidays the first week of January argue against planning a launchduring thatperiod. The statecommission investigatingthe failure was led by G.G. Raikunov, director general ofRussia'sstate-owned TsNIIMash space engineering services company. In astatement of preliminary findings that Raikunov signed Dec. 10, thecommissionsays: "[Telemetry] data analyses ? show that no issues with thefunctioning of [Proton's three-stage] systems and assemblies have beendetected? In view of the above, the Interdepartmental Commission deems itpossible toproceed with further technical facility processing operations of [thelaunchvehicle] to launch ? Ka-Sat per the approved schedule."